Mysore Pak is a sweet delicacy that originated in South India, to be more precise Mysore (hence the name Mysore Pak). 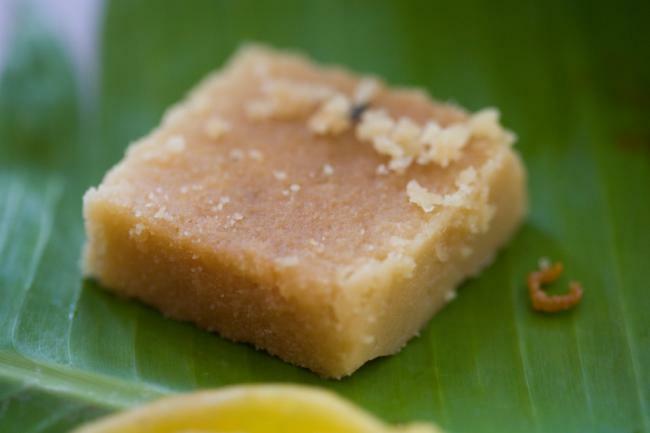 This awesome melt-in-the-mouth dessert has gram flour as its main ingredient. While its not very easy to make and requires a lot of attention and labor, the result is sure to be worth all the trouble! Give your festivals a traditional touch with this sweet treat. Put two woks or frying pans side by side on medium heat. Add oil in one and one cup sugar with ½ cup water in another to make sugar syrup of one string consistency. Take gram flour in a bowl and pour in one ladle-full of smoky hot oil over it. Crumble and mix nicely and sieve it so that no lumps are left in the gram flour. In between keep on stirring sugar syrup. In the pan that has oil remaining, add ghee and let it melt. Check if the sugar syrup has come to the required consistency i.e. one string. To check it just drop little of syrup in a bowl, cool it and then touch with your index finger. Then press the drop on your finger with your thumb, a thin string should be formed when finger and thumb are taken apart from each other slowly. Pour in the gram flour and oil mixture slowly into the boiling sugar syrup while stirring regularly to ensure no lumps are formed. Maintain the heat at medium-high. Now start pouring in smoky hot melted ghee and oil mix into the wok of sugar syrup and gram flour stirring regularly. Tip: Continuous stirring is very important while making Mysore Pak and the edge of the ladle or specula should touch and rub the base of the wok otherwise gram flour might get burnt. Pour in a ladle full or 3/4 at a time. Formation of foam is normal; this foam will create the net effect in the delicacy. Keep pouring in ghee and stirring it until the entire ghee-oil mixture is consumed. Add the green cardamom powder and keep on stirring until the gram flour mixture starts leaving the edges of the wok. Turn off the heat immediately and pour the contents into a greased deep platter or a cake tray. Tap the tray to make the surface even. Tip: Transfer the contents immediately from wok to the greased tray otherwise it might get over cooked and burnt. Let it cool and settle for 7 to 8 minutes and then make deep slits to make pieces of desired size on the settled and semi tight mixture. Don’t try to pick the pieces at this stage; let it solidify nicely, this might take 15 to 20 minutes. Tip: This Mysore Pak mixture starts solidifying immediately as it gets colder in the tray, therefore the deep slits should be made at the stage while it is soft and be sure that the edge of the knife cuts it till the base of it. Also wipe and clean the knife after every slit to obtain nicely cut pieces of Mysore Pak. Pick the pieces gently and carefully as it might be too hot to handle, arrange them on a platter and serve. Tip: You may store Mysore Pak in a jar for a month.